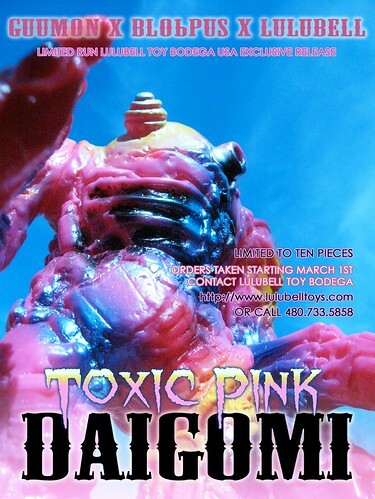 We are excited to be releasing a limited run of 10 ToxicPink Daigomi by artist Brian Mahony of GUUMON TOYS. Each figure is hand painted and signed by Kaji of BLObPUS. Only ten are available to the US market and they are available for pre-order starting March 1st, so don't miss this opportunity to score such a hot piece of vinyl toy history! Daigomi comes with stickers and other goodies, bag and header, all in a sweet looking drawstring backpack. To find out more about GUUMON TOYS please check out the GUUBLOG or check out the GUUMON Facebook photo album! Availble 3.1.2012 at Noon Pacific Time for $190! 3A x KOJIMA MGS REX Onsale March 2nd...!!! 3A 1/12th Black Hole Mongrol and 1/6th RO-JAWS!! Grody Shogun Anti-Valentines Day Releases..!! DIY Toy Weapons from Household Items. MonstreHero 2012 Lucky Bags On Sale Now..!! Ready for Even More GARAMANIACAL???? 3A Action Portable Popbots Available NOW..!! SKINNER "Every Man is My Enemy" Book...! !